(1953) "I Speak to the Stars"
"Secret Love" is a song composed by Sammy Fain (music) and Paul Francis Webster (lyrics)  for Calamity Jane, a 1953 musical film in which it was introduced by Doris Day in the title role. Ranked as a number 1 hit for Day on both the Billboard and Cash Box, the song also afforded Day a number 1 hit in the UK. "Secret Love" has subsequently been recorded by a wide range of artists, becoming a C&W hit firstly for Slim Whitman and later for Freddy Fender, with the song also becoming an R&B hit for Billy Stewart, whose version also reached the Top 40 as did Freddy Fender's. In the U.K., "Secret Love" would become the career record of Kathy Kirby via her 1963 remake of the song. The melody bears a slight resemblance to the opening theme of Schubert's A-major piano sonata, D.664. Doris Day first heard "Secret Love" when its co-writer Sammy Fain visited the singer's home and played it for her, Day being so moved by the song that she'd recall her reaction as being: "I just about fell apart". Day recorded the song on 5 August 1953 in a session at the Warner Bros. Recording Studio (Burbank), overseen by Warner Bros. musical director Ray Heindorf. On the day of the recording session for "Secret Love", Day had done vocal exercises at her home. Then about noon — the session being scheduled for 1 p.m. — she had set out on her bicycle to the studio. Heindorf had rehearsed the studio orchestra prior to Day's reaching the studio; upon her arrival, Heindorf suggested that Day do a practice run-through with the orchestra prior to recording any takes, but acquiesced to Day's request that her first performance with the orchestra be recorded. Day recalls, "When I got there I sang the song with the orchestra for the first time ... That was the first and only take we did." ... "When I finished Ray called me into the sound booth grinning from ear to ear and said, 'That's it. You're never going to do it better.'" 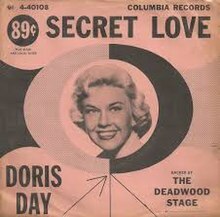 The single of "Secret Love" was released on 9 October 1953 - three weeks prior to the premiere of the Calamity Jane film - by her longtime record label, Columbia Records in both 45 and 78 rpm format (cat. no.40108). The single entered the Top 20 bestselling singles survey - at number 17 - on Billboard magazine dated 9 January 1954 with the single reaching number 1 on the Top 20 survey for the week ending 17 February 1954, the week in which the song's Academy Award nomination for Best Song had been announced, the nominations for the 26th Academy Awards for the film year 1953 having been announced two days earlier. Day's "Secret Love", having spent three weeks ranked as the number 1 bestselling single by Billboard, was still ranked as the number 4 bestseller the week of the 26th Academy Awards broadcast which occurred 25 March 1954. However, Day herself declined to perform the nominated - and ultimately victorious - "Secret Love" at the Academy Awards ceremony, later stating: "When they asked me to sing 'Secret Love' on Academy Awards night I told them I couldn't - not in front of those people". (Ann Blyth performed "Secret Love" at the Academy Awards ceremony.) Day's refusal to perform "Secret Love" on the Academy Awards broadcast resulted in the Hollywood Women's Press Club "honoring" the singer with the Sour Apple Award as the most uncooperative celebrity of 1953: this put-down occasioned a bout of depression which kept Day virtually housebound for several weeks, and which Day eventually had to qualify her Christian Science outlook to deal with, consulting with a medical practitioner. "Lord Help Me Be as Thou"
At the time of the release of the Doris Day version of "Secret Love" two vocal cover versions were issued, one of which - by Gogi Grant with the Harry Geller orchestra - is said to have been recorded at RCA Victor's LA recording studio in July 1953 which would make its recording earlier than Day's: the other vocal cover was recorded for MGM by Tommy Edwards with the LeRoy Holmes orchestra. Bing Crosby also had a single release of "Secret Love", recorded for Decca in Los Angeles in a 31 December 1953 session with the John Scott Trotter Orchestra and it was included in his album Bing Sings the Hits (1954). On 4 December 1953 Slim Whitman made a recording of "Secret Love" in Baltimore MD: Whitman's version reached number 2 on the C&W chart in Billboard magazine in the spring of 1954 concurrent with the Doris Day version being number 1 on the magazine's Pop chart. Both the Moonglows and the Orioles covered "Secret Love" for the r&b market, the Moonglows' track being recorded in Chicago 10 January 1954 while the Orioles' track was recorded in New York City 29 January 1954. "You Have to Want to Touch Him"
(1963) "Let Me Go, Lover"
In 1963 Kathy Kirby remade "Secret Love"; released in October 1963 as a single, the track - with musical direction by Charles Blackwell, Jimmy Page on guitar, and production by Kirby's regular collaborator Peter Sullivan - afforded Kirby her UK career record with a number 4 UK chart peak that December. "Secret Love" was also a hit in Australia reaching number 2. Kirby would recall: "[when] 'Secret Love'...was suggested by my recording manager Peter Sullivan[,] I said 'But that's already been done beautifully by Doris Day!' Peter came up with a completely different version, up-tempo and starting with the middle eight. We took a chance on it and decided that if it didn't chart it would at least be a prestige number, so we were thrilled when it sold over half a million copies in three weeks". "Secret Love" provided the title for a jukebox musical depicting Kirby's life story, which following its debut run at the Leeds City Varieties commencing 9 May 2008 played venues throughout England into 2009.
from the album Are You Ready For Freddy? "Since I Met You Baby"
(1975) "The Wild Side of Life"
Freddy Fender remade "Secret Love" for his 1975 album release Are You Ready For Freddy? recorded in the summer of 1975 at the SugarHill Recording Studios (Houston): issued as a single in October 1975 "Secret Love" afforded Fender the third of his four number 1 hits on the Billboard C&W, also crossing-over to the U.S. Top 40 of Billboard Hot 100, reaching number 20. (Fender would score one subsequent Top 40 hit, his fourth C&W number 1 hit "You'll Lose a Good Thing" crossing-over to the number 32 on the Hot 100.) Fender remade "Secret Love" for his 2002 album ''La Musica de Baldemar Huerta. (1966) "Every Day I Have the Blues"
John Serry Sr. arranged and recorded this composition with his ensemble on Dot Records (DLP-3024) for his album Squeeze Play in 1956 and on Versailles Records (90 M 178) on Chicago Musette -John Serry et son Accordén in 1958. Connie Francis recorded "Secret Love" in a 27 April 1962 session at RCA Italiana Studios (Rome)for her album Connie Francis sings Award Winning Motion Picture Hits. The original version from April 1962, with an arrangement by Geoff Love, was only available in Australia (MGM Records) and New Zealand (MGM). All other worldwide releases of that album included a version with a new orchestration recorded in April 1963 with an arrangement by Don Costa. George Wright covered the song in his 1984 album Red Hot and Blue. "Secret Love" has been performed in various stage productions of the stage musical version of Calamity Jane - see Calamity Jane (musical) - in the US by Edie Adams, Martha Raye, Carol Burnett - who also sang the song in a 12 November 1963 televised broadcast of the Calamity Jane stage musical - , Ginger Rogers, and Louise Mandrell; in the UK by Barbara Windsor, Louise Gold, Gemma Craven, Toyah Willcox, and Jodie Prenger; and in Australia by Rowena Wallace. Craven, who played the title role in an extensive touring production of Calamity Jane in 1995 and 1996, may be heard singing "Secret Love" on a 1995 cast album of Calamity Jane (Craven is the sole vocalist on the album). Willcox, who in the summer of 2003 played the title role of Calamity Jane in the stage musical's West End production, has said of "Secret Love": "It's a great song to sing; it's very powerful, and emotionally—and musically—it's the pinnacle of the whole show." ^ a b c d Roberts, David (2006). British Hit Singles & Albums (19th ed.). London: Guinness World Records Limited. p. 135. ISBN 1-904994-10-5. ^ keeping the tradition of TV and Silver Screen hits the Bar G Wranglers in Bryce Canyon continue to keep this great song alive as well. Whitburn, Joel (1973). Top Pop Records 1940-1955. Record Research. ^ a b c d McGee, Garry. Doris Day: Sentimental Journey. Jefferson NC: McFarland & Co. pp. 23–25. ISBN 978-0-7864-6107-3. ^ Whitburn, Joel (1973). Top Pop Records 1940-1955. Record Research. ^ "A Bing Crosby Discography". BING magazine. International Club Crosby. Retrieved June 29, 2017. ^ "Biography". Kathy Kirby. Retrieved July 23, 2016. ^ Nielsen Business Media, Inc. (December 28, 1963). Billboard. Nielsen Business Media, Inc. p. 16. ISSN 0006-2510. Retrieved July 22, 2013. ^ Nielsen Business Media, Inc. (March 21, 1964). Billboard. Nielsen Business Media, Inc. p. 32. ISSN 0006-2510. Retrieved July 22, 2013. ^ a b Nielsen Business Media, Inc. (March 14, 1964). Billboard. Nielsen Business Media, Inc. p. 31. ISSN 0006-2510. Retrieved July 22, 2013. ^ Nielsen Business Media, Inc. (January 11, 1964). Billboard. Nielsen Business Media, Inc. p. 30. ISSN 0006-2510. Retrieved July 22, 2013. ^ Nielsen Business Media, Inc. (December 21, 1963). Billboard. Nielsen Business Media, Inc. p. 20. ISSN 0006-2510. Retrieved July 22, 2013. ^ "Dot Album Discography, Part 2 (1955-1960)". Bsnpubs.com. Retrieved January 15, 2019. ^ "CHICAGO MUSETTE". BnF Catalogue général. January 15, 2019. Retrieved January 15, 2019. ^ a b c d e f g Gioia, Ted (2012). The Jazz Standards: A Guide to the Repertoire. New York City: Oxford University Press. p. 363. ISBN 978-0-19-993739-4. ^ DeLay, Tom (January 1985). "For the Records". Theatre Organ. 27 (1): 19. ISSN 0040-5531. ^ "Calamity Jane to Arrive in London in June; star Wilcox chats about musical". Playbill.com. Retrieved September 26, 2015. "Any Way the Wind Blows"
"By the Light of the Silvery Moon"
"If I Give My Heart to You"
"If You Were the Only Girl (In the World)"
"My Dreams Are Getting Better All the Time"
"Que Sera, Sera (Whatever Will Be, Will Be)"
"(Why Did I Tell You I Was Going To) Shanghai"
"You Should Have Told Me"
"It's a Sin to Tell a Lie"
"Before the Next Teardrop Falls"
"The Wild Side of Life"
"You'll Lose a Good Thing"
"Please Talk to My Heart"
"The Way You Look Tonight"
"When You Wish Upon a Star"
"The Last Time I Saw Paris"
"It Might as Well Be Spring"
"On the Atchison, Topeka and the Santa Fe"
"In the Cool, Cool, Cool of the Evening"
"High Noon (Do Not Forsake Me, Oh My Darlin')"
"Three Coins in the Fountain"
"Love Is a Many Splendored Thing"
"Days of Wine and Roses"
"The Shadow of Your Smile"
"The Windmills of Your Mind"
"Raindrops Keep Fallin' on My Head"
"We May Never Love Like This Again"
"Evergreen (Love Theme from A Star Is Born)"
"You Light Up My Life"
"It Goes Like It Goes"
"Arthur's Theme (Best That You Can Do)"
"I Just Called to Say I Love You"
"(I've Had) The Time of My Life"
"Sooner or Later (I Always Get My Man)"
"My Heart Will Go On"
"You'll Be in My Heart"
"If I Didn't Have You"
"Al otro lado del río"
"It's Hard out Here for a Pimp"
"I Need to Wake Up"
1978: "Rivers of Babylon" / "Brown Girl in the Ring" – Boney M.
This page was last edited on 4 April 2019, at 21:07 (UTC).